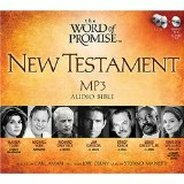 The Word of Promise is an audio Bible, dramatized by an all-star cast of actors, including Jim Caviezel as Jesus, Richard Dreyfus as Moses, Gary Sinise as David, Jason Alexander as Joseph, Marisa Tomei, Louis Gossett Jr., and over 600 actors contributing to this timeless work. This audio Bible is produced with state of the art audio technology, including sound effects and an original musical score. Now you can get into the Word as never before with this highly dramatized recording of the New Testament. The accomplished cast includes Sean Austin as the Narrator, AnnaSophia Rob as Mary Magdalene, Marshall Allman as Paul, Emily Osment as Mary, Mother of Jesus, Cody Linley as Jesus, Jordin Sparks as Elizabeth, Corbin Bleu as Peter, and many others.